The Deputy Governor of Imo State, Prince Eze Madumere, has called on the leadership and members of All Progressives Congress to remain united, charging them to join hands to rebuild and reposition the party. The Deputy Governor who is the leader of the party in the state made the assertion while addressing a cross section of APC faithful from Mbaitoli local government area of Imo State at his country home, Lake Malinda, Mbaitoli local government area of Imo State. Madumere commended his party members for their resolute to rid the party of unpatriotic elements, including Rochas Okorocha who he described as a man who after eating a meal served him by the people of Imo state, chose not to say thank but instead broke the plate. He insisted that APC never lost any elections in Imo but that the party is more interested in producing a leadership that will stand for the people, empathize with the people and ultimately change their situation from worse to better. He therefore advised all the members not to ever leave the party, saying that the party remains in the mainstream have won the presidency and also in strong control of the National Assembly. He said that with what the party will achieve, it is easy to bounce back. He also hinted that he will join hands with other forward looking leaders of the party to rebuild and reposition the party against future elections. He insisted that APC is the best thing that has happened to Nigeria by its policies. “For the first time, we have a focused government led by President Mohammadu Buhari that is more interested, not just only in the growth of the nation but in its development. We are all witnesses to what is going on in agriculture, transport, anti-corruption, aviation and now textile industry;” he said. 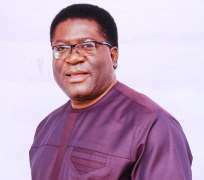 Speaking earlier, the local government Chairman of the party, Barrister Tony Amadi, showered encomium on Madumere for his resilience, focus and sacrifice, saying without his leadership and temperament, the story would have devastating. He recounted how most people in the leadership of the party all gave up hope, but Madumere chose to continue and even recruited more high profile politicians to join him in the battle to salvage both the party and retrieve the state from stranglehold of ‘familiocracy’. His words: “This was a man who was denied everything yet he said no to impunity and family political dynasty. At a time, some of our people left the party but Madumere as a disciplined leader with integrity; he remained in the party and gave all of us hope. Today, we may not be in power but he is certainly the hero of the New Imo with New Hope. APC fought to restore the dignity of the people”. Among others that spoke during the get-together are members representing Mbaitoli and Ikeduru State constituencies, Hon. Ifeanyi Nnataraonye and Hon. Uche Oguwuike respectively. They used the opportunity to than the party faithful for the supports during their ordeal of suspension from the House of Assembly.